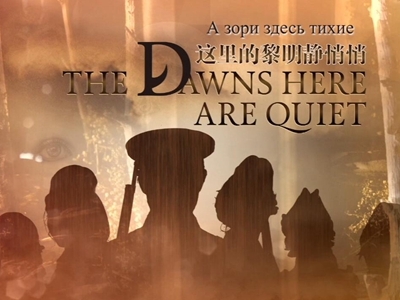 Invited by the Mariinsky Theatre and the Alexandrov Ensemble of the Russian Ministry of Defense, The Dawns Here Are Quiet, an opera commissioned by the National Centre for the Performing Arts (NCPA) in China, will tour to Russia from September 11th to 15th, to begin a “China-Russia Friendship and Culture Tour”. 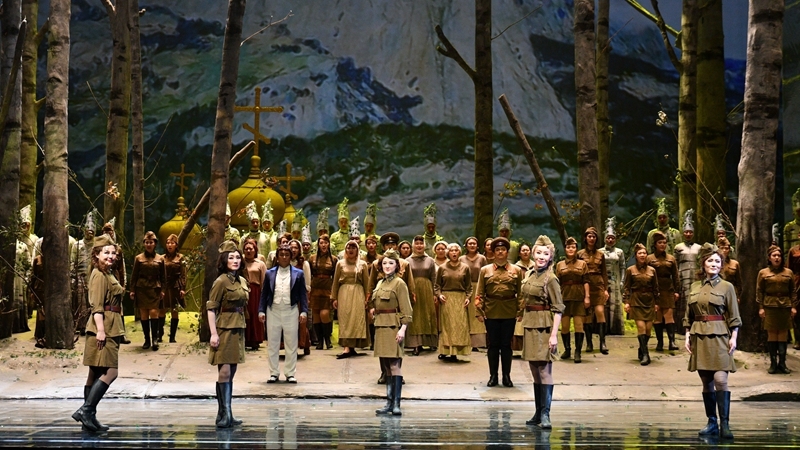 From September 11th to 12th, this NCPA opera commission will debut at the Mariinsky Theatre. The Mariinsky Symphony Orchestra and the Western Military District Ensemble will cooperate for the first time with the NCPA to present this classic work. On September 14th-15th, at the Central Academic Theatre of the Russian Army, the NCPA will present two “Hello, Russia!” concerts of classical opera arias performed by Chinese and Russian artists, celebrating the long-lasting friendship between China and Russia. On August 20th, the NCPA held a press conference on this tour to Russia. ZHAO Jiachen, Vice President of the NCPA, JIANG Peng, Deputy Director of the Division for Eastern European and Central Asian Affairs, Department for External Cultural Relations, Ministry of Culture and Tourism, Kalinyuk Alexander, Press Officer of the Russian Embassy in Beijing, as well as Composer TANG Jianping, Director WANG Xiaoying, and lead singer ZHANG Yang from The Dawns Here Are Quiet attended the conference, introducing the overall arrangements and highlights of the tour. With the strong support from the Ministry of Culture and Tourism and the Ministry of Foreign Affairs, the NCPA opera commission The Dawns Here Are Quiet Russia tour is a part of the “Chinese Culture Festival” in the years of China-Russia local cooperation and exchange. The NCPA will represent China once again on the stage of world-renowned theatres, presenting excellent original works of China to show the cultural confidence and consciousness of Chinese theatres in the cultural exchange between China and other countries, conveying the Chinese voice to show the soft power of Chinese culture, and at the same time further strengthening the mutual illumination of Chinese and Russian civilizations, enhancing understanding and deepening friendship between the two countries. The NCPA has established a strategic partnership with the Mariinsky Theatre and a profound friendship with the Alexandrov Ensemble, which has a glorious history. This will be the first time for a NCPA opera commission to be performed at the home stage of these two “old friends”. 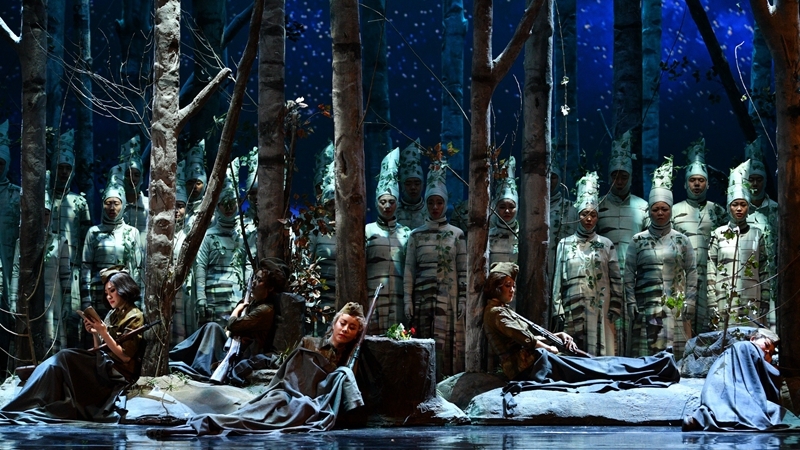 In particular, it has been included in the performance season of the Mariinsky Theatre. This fully illustrates that with the rich accumulation of more than 80 productions in the past ten years, the first-class production strength of the NCPA has been recognised by peers in the world. It is worth mentioning that the Mariinsky Symphony Orchestra will join in this opera performance. This will also be the first time for LÜ Jia, Artistic Director of the NCPA to conduct the Orchestra. The Mariinsky Theatre has attached great importance to this cooperation and has organised a rehearsal for LÜ Jia already this July, which proceeded smoothly. 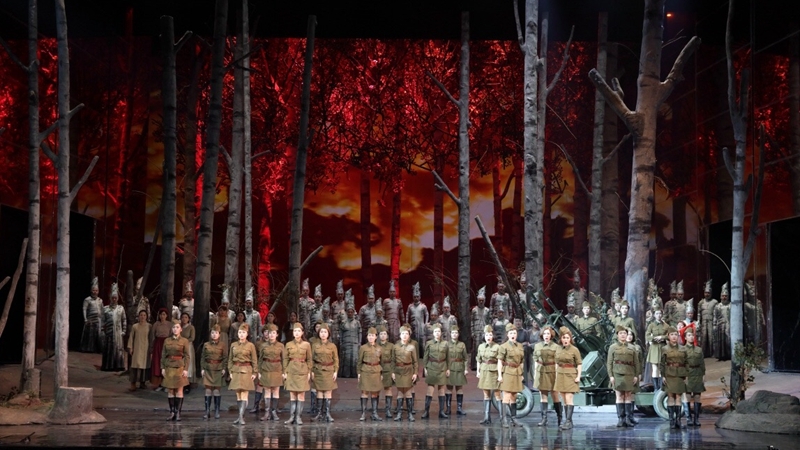 The ballet in the opera showing the beauty of women soldiers will be played by ballet dancers from the Mariinsky Ballet. Besides, performers of the Western Military District Ensemble will share the stage with Chinese singers such as ZHANG Yang, XU Xiaoying, WANG Hongyao, LI Xintong, ZHANG Zhuo, LIU Lian and the NCPA Chorus. After the opera performance, the Mariinsky Symphony Orchestra will “accompany” the NCPA to Moscow. At the Central Academic Theatre of the Russian Army, artists from the three art institutions will gather in Moscow to present two “Hello, Russia!” concert performances of opera arias. Chinese singer SUN Xiuwei, who is active on the world opera stage, will also join the concert. The collaborative performances will inspire artists from the two countries to carry out more profound artistic exchanges, deepening Russian audiences’ understanding of Chinese culture. While the NCPA brings works of Chinese style and characteristics to the stages of top art institutions in the world, it is also continuously exploring a new model of culture “going global”. Major overseas tours of the NCPA, such as the North American tour of the NCPA Orchestra and the Italian tour of opera commission Rickshaw Boy, have all beeincluded in the performance seasons of the world’s top theatres and concert halls. 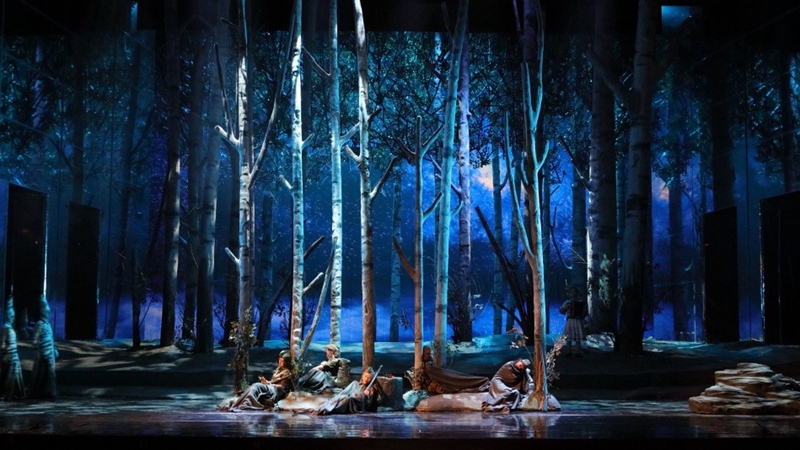 The Dawns Here Are Quiet has also been included in the 2018/19 season of Mariinsky Theatre. This illustrates not only the affirmation of international counterparts on the artistic quality and brand influence of NCPA productions, but also the cultural confidence of the NCPA in promoting culture “going global” through a business model. In the Russia tour, highlights also include a variety of art exchange activities. Lead singers from the opera The Dawns Here Are Quiet will visit, for example, the Confucius Institute of St. Petersburg University, the Chinese Cultural Centre in Moscow, to hold in-depth artistic dialogues and exchanges with the Russian cultural and artistic circles, university students and art lovers.